In 1983, in New York City, Philip Glass was preparing to close the private imprint Chatham Square Productions, which he had run since 1971 with the gallerist Klaus Kertess. His final release would be a sequence of short orchestral works composed by a local cellist who was better known for his disco productions: Arthur Russell. Tower Of Meaning was Russell’s first LP, one of four he released in his lifetime, alongside seemingly innumerable 12-inch EPs which appeared under a range of aliases. From the off-kilter groove of ‘Is It All Over My Face’ – remixed by Larry Levan into a Paradise Garage favourite and 1979 Billboard dance chart Top 40 – to the transcendental solo cello of World Of Echo, which came out on Rough Trade in 1986, Russell’s musical output, before his death from Aids-related complications in 1992, has become legendary in its diversity and unclassifiability. Last year his archives – including vast quantities of unreleased music – were acquired by the New York Public Library. With only 320 copies pressed, Tower Of Meaning quickly went out of print and remained so until Audika Records’ reissue last year. This weekend it will be presented in the UK for the first time, performed by Russell’s longstanding collaborators Bill Ruyle and Peter Zummo alongside the London Contemporary Orchestra, with Oliver Coates on cello. The performance will open with the UK premieres of Joy Boy by the late composer Julius Eastman, who conducted Tower Of Meaning for the LP recording (he also provided vocals for both the yowling title phrase on Russell’s 1982 disco track ‘Go Bang’ and for Nonesuch’s 1973 Grammy-nominated recording of Peter Maxwell Davies’ Eight Songs For A Mad King), and Wolff Tones E-Tudes by the composer Mary Jane Leach, who, as a researcher and archivist, has also led the recent rediscovery of Eastman’s work. 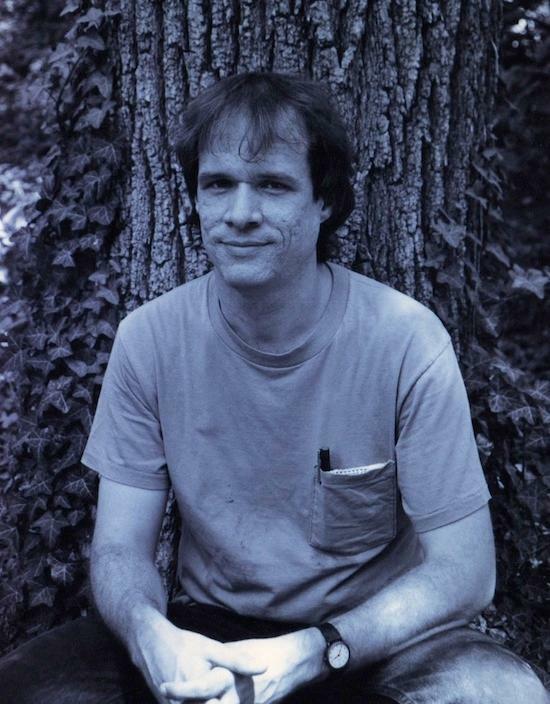 Bill Ruyle: I first became aware of Arthur Russell during my last year at the Manhattan School of Music, where I studied percussion and music theory. I knew that he was a composition major. I was officially introduced to him in August 1974, through another MSM composition major, Don Salmon. At this time Arthur was already a music curator at The Kitchen. Arthur was interested in a loft space that I was renting from Don in the East Village and eventually took it when I moved out in autumn 1974. On our first meeting we talked about music, particularly Indian music, as I had recently begun studying and practicing tabla, about the music of the Velvet Underground, and about natural food restaurants in the neighbourhood. I re-met Arthur in 1976 or ’77 through Peter Zummo, whom I had worked with at LaMama Experimental Theater Company. Peter was excited about working with Arthur and had told me about sessions he had done with Arthur, who had written horn arrangements for very early Talking Heads songs. I had started playing with Peter at a studio that he shared with Arthur in Westbeth in the West Village, and was invited to an initial rehearsal of Peter Gordon’s Love of Life Orchestra, then a collective of composer-players. Arthur’s offering at that rehearsal was an instrumental pop music chart that I really liked. It met with some criticism from at least one of the more jazz-oriented members of that rehearsal. It was then that I realised that Arthur dug pop music. Peter Zummo: In late 1981 or early 1982 the Lounge Lizards began rehearsing in one of the basement studios in Westbeth, an innovative artists’ housing complex. (Until 1966 the building housed Bell Labs, an early incubator for cinema, audio, television and computer technology.) The remnants of elevated train tracks connected to the second floor. The rest of the tracks are now the High Line Park. The Merce Cunningham studio was the penthouse. The basement was used by jazz musicians and various rodents. I had a key to the rehearsal studio. One day I was served with an eviction notice, and when I investigated, I found that Paul Bley had the lease on the room and that the rent hadn’t been paid in some time. I arranged a plan such that the rent, $120 monthly, was shared three ways between me, Arthur and the Lounge Lizards. This worked reasonably well. Thus Arthur and I worked, often overlapping our allotted times in the studio, almost daily for some years. I used the morning shift and frequently had to wake Paul up, if he was playing in the city or heading to or from Europe. This led to many extended lectures by Paul on music, publishing, the music business and many other topics. I couldn’t wait for Paul to head out so I could play. By the time Arthur arrived I was warmed up. BR: I don’t remember exactly when I started playing with Arthur in Zummo Labs, but it was in the 1970s and at Westbeth. Around this time Peter and Arthur shared a concert at the Franklin Furnace in Tribeca. I played with Peter and after Peter’s set Arthur asked me if I would join in playing percussion along with Dave Van Tieghem and the rest of the ensemble in a performance of Instrumentals. I said “yes”, of course, but had no idea what the piece was about. Arthur gave me very simple and clear instructions and that was that. The performance began and I was overwhelmed by the majesty and beauty of Arthur’s structures and the commitment and involvement of the performers. That was a really good day. I played more Instrumentals excerpts in various clubs in the late 1970s with Arthur and Peter. I continued playing with Arthur almost exclusively as a bandmate in Peter’s ensembles. Sometimes we would rehearse at my apartment in Brooklyn. We would usually play Peter’s music but sometimes we would read classical music or early music. I remember one rehearsal when Arthur showed up with his cello (of course) and a coconut. He asked me if I had anything that could break open a coconut. I got a hammer and a screwdriver. My tools were not that great but we got the coconut open. It was then that Arthur told me that he didn’t care about eating the coconut but that he wanted to use a piece of the shell as a pick for his cello. So it went. It may have been at this rehearsal that I showed Arthur my Marantz cassette recorder with varispeed playback and he insisted that we try to play with recordings of ourselves at slower speeds. PZ: In Westbeth Arthur and I played our own compositions, sometimes Bach, and often Christian Wolff’s Exercises, and experimented with amplifiers, cassette recorders and other devices. We also played from jazz lead sheets that I had. One that was of harmonic and melodic interest to us was Jimmy Van Heusen’s ‘Here’s That Rainy Day’. We also played songs by John Coltrane and Miles Davis. Arthur had a large black plywood speaker cabinet with a 15-inch speaker in it. Stencilled on the top was “Philip Glass Ensemble” and another address at Westbeth. Arthur had had his Ampeg Gemini guitar amp modified to provide a second output for the big speaker cabinet. Philip told Arthur that he should have thrown the box away. I have the cabinet now and plan to restore and upgrade it. We made a big sound. I don’t remember when we might have touched on material related to Tower of Meaning, but it’s not out of place with the range of material we worked on, discussed and recorded. One day we recorded on a portable cassette machine, which, regrettably, I was later persuaded to sell to an aunt-in-law. We really liked the distortion it made resulting from using the built-in microphones. We definitely played around with the speed control on my Otari 2-track machine. BR: I didn’t play any more of Arthur’s scores until I was called to play for a recording session in the early 1980s. Arthur asked me to play glockenspiel, which I had recently purchased from one of Peter’s in-laws. It was an overdub session somewhere in midtown Manhattan. I remember that Julius Eastman was there but I don’t remember much contact with him during the session. I do remember that other musicians were overdubbing parts at the same time – probably Peter was there. I was presented with music that was written in two staves and told that both were treble clef. There was one whole note per measure on the upper stave and sometimes an additional note on the lower stave. Between the staves there were numbers that indicated the duration of beats per note. There were some asterisks written in some of the measures between staves. I was told to play only the notes in measures with asterisks. The recording was done with a click track and Arthur’s voice counting the number duration of each note. I was overdubbing to tracks that had been previously recorded. I remember doing only one long recording pass without stopping – maybe 20 minutes? It was quite challenging, a foreign way of recording for me. But that was it, mistakes and all, no second take. I didn’t know anything about what I had just recorded. PZ: Julius called at 7am on a Sunday morning to book me for the session. I said, “Julius, it’s 7am on Sunday morning!” He said he was contracting this session and he could call whenever he wanted to. I said I was available. Mary Jane Leach: Arthur, Peter, Julius and Bill were involved in many more musical scenes than I was, but as in a Venn diagram, we all overlapped in what has been called the downtown new music scene. I’ve been struck by the similarities of Arthur and Peter’s working methods, with the seemingly infinite versions of their pieces, occasionally capturing on tape a “finished” version, but with so many more possibilities left to explore. PZ: Bill’s reminiscence helps me to visualise the recording session – various instruments tucked here and there into corners of the studio, and reading from a part or score with whole notes with numbers indicating how many beats to hold the note. It wasn’t a strange musical experience but rather another investigation in our ongoing experiment. BR: Months later I learned what it was. Peter told me that Arthur had made a record of some beautiful, very slow-moving music, chords sounding, taking time… I eventually heard it and was very moved by it. It was the Tower of Meaning LP. Arthur gave me two copies, which I still have. At the time I was vaguely aware that Tower of Meaning was music that had come out of a Robert Wilson project. Philip Glass had referred Arthur to Robert as a composer for Robert’s production of Medea [the Euripides tragedy, for which Gavin Bryars later completed the score. After a two-year delay it was eventually staged in 1984]. Tower of Meaning is excerpts from the Medea score. Arthur was released – fired – from the Wilson production after workshop performances at the Kennedy Center in Washington DC. A year after Arthur passed away, a memorial concert was planned for the World Financial Center Winter Garden in downtown Manhattan. I knew that I wanted, somehow, to present side two of the Tower of Meaning LP. I contacted Tom Lee, Arthur’s partner, and asked him for help. He gave me a shopping bag full of music and said, “I think this is Tower of Meaning music.” Two cassette tapes were in the bag as well. For a while I couldn’t find anything in the notated parts that corresponded with what I was hearing on the LP. There was no composite score included. So I started transcribing what I heard on the record. But I kept going back to the original parts, pages and pages of whole notes with numbers written above or below them. I knew that these numbers indicated duration, so at least I had some rhythmic clues, but the pitches weren’t matching up. Eventually I played one of the cassettes and found a recording of side two of the LP played by strings and oboes, but it sounded faster and higher than the LP. In fact, it sounded a perfect fourth higher. There were some reference numbers on the label of the cassette that looked familiar. I found corresponding numbers on the instrumental parts and started combining the parts into a simple score. And eureka! The parts combined to sound like what was on the LP, but a perfect fourth higher. It was then that I realised that Arthur had varispeeded the original recording. What was also apparent was that the top “melody” that I was hearing, and looking for in the original notation, was actually a composite of two or three parts that would often cross each other in close harmony. The “melody” that I was hearing was not reflected in a singular instrumental part. I later found that other sections of the LP were varispeeded at different rates. Section A was a half step up; Sections B and C, a minor sixth down; part two of Section D, half speed (an octave lower); Section F, half speed; and Section G (side two of the LP), a perfect fourth lower. Other sections are at the original speed. I don’t think this was an accident on Arthur’s part. I think that he liked the tonal and timbral variety that varispeeding offered, and using studio technology was a part of his process. Of course, back then this was all being done with tape machines. So I decided to present Tower of Meaning as it is heard on the LP. This has presented some challenges, as the range of the varispeeded recording often extends lower than the ranges of the instruments that originally played the parts. So at times we are using violas instead of violins and English horns instead of oboes. In any case, it is still an experimental process. I have also changed the original notation to more conventional notation, using different relative note values and metered measures. I may come to regret this approach but given rehearsal time constraints, I think this is the way to go for now. There is still a lot more Tower of Meaning material that does not appear on the LP that can be explored. MJL: The first performance of Wolff Tones E-Tudes was with the DownTown Ensemble, in Renee Weiler Hall in Greenwich Village. Peter was at the premiere. It was written for a concert celebrating Christian Wolff. PZ: Wolff Tones E-Tudes is an example of the process-based, open-form compositions we’ve worked with over the years. Often these combined concise notated material with verbal instructions. I find myself looking for meaning in the title, given Mary Jane’s affinity for wordplay. “Wolf tones” are unintended, and presumably unpleasant, resonances inherent in some instruments, especially strings. MJL: Wolff Tones E-Tudes has six sections. Each section has a number of phrases, except for the first section, which has only one. The performers select a phrase from each section, repeat it a number of times and then choose another, until moving on to the next section. Upon successive repetitions the phrases chosen can either be the same or different from the ones chosen previously. PZ: These programme notes describe the structure of the piece and the process the musicians are to follow, but make no specific reference to the “wolf tone” phenomenon. Then, what are we to make of “E-Tude”? Something to do with Brutus? MJL: When we performed with the DownTown Ensemble, we would spend a great deal of time discussing the pieces – the logistics, the intent of the composer, etc. I think all three pieces – Wolff Tones E-Tudes, Joy Boy and Tower of Meaning – require that: a communal working-out. PZ: An underlying and recurring theme in our approach since the ’70s is to view the ensemble as a social unit, co-operating in a way that reflects, or hopefully so, the larger society – democracy. Contemporary society, that is, rather than that of 19th-century Europe, for example. The instrumentation of the ensemble, in various genres, was more about the individual than about which instrument she plays. At the same time, the compositions were not necessarily written for specific instruments. Blues, rock and jazz groups seem to be a precedent for this sense of the ensemble. MJL: I have probably spent more hours in rehearsal with Peter and the other musicians, debating and discussing how a piece is meant to be put together, what the intent of the composer was, than actually playing the piece under discussion. Hopefully these intents will be realised and documented before our collective memories fail us. PZ: And I recorded a number of those rehearsal discussions. I’ve been fascinated, and sometimes frustrated, with the tangential and recursive questions and concerns raised by the individual musicians. But this was possible because we didn’t use top-down direction, but rather enjoyed, or indulged, in taking the time to let everyone react to, or be confused by, the score, including when the composer was present. MJL: Joy Boy was commissioned by the Composers Forum and premiered on November 6, 1974 in Albany, NY in the Arts Center on the campus of the Academy of the Holy Names, paired with Femenine. This programme was also performed at The Kitchen the following March. Tower of Meaning at Kings Place, London is now sold out.